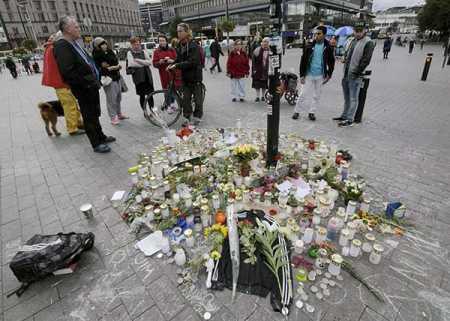 People lit Candles and placed wreath at Station Square in Helsinki on Monday to mourn the death of a passer-by. Photo – Lehtikuva. The man, who was arrested in connection with assaulting a man to death at the Helsinki Central Railway Station on September 10, had reported the matter to the police by himself, according to information obtained by news agency STT. A passer-by was beaten up outside the Helsinki central railway station where the Finnish Resistance Movement was holding a demonstration on September 10. The man succumbed to his injuries at the Helsinki Meilahti hospital on September 16. The case is being investigated as assault and aggravated manslaughter. The 1990-born suspect having a violent criminal background and history with neo-Nazi estab-lishment in the country was arrested in the early hours of Sunday. Earlier in 2010, the man together with an accomplice knocked down another man following an incident at a street in Helsinki. The suspect kicked the victim on the face and other parts of the body together with his crime partner. Passers-by intervened to end the assault. In 2011, the man tried to prevent a police officer from arresting another by shoving and grabbing the constable. Besides assault and aggravated assault, the man has been convicted for at least insubordination, smuggling, possession of dangerous substance and aggravated vandalism. Previously he has received conditional as well as unconditional prison sentences. The man is still in detention, and according to lead investigator Teemu Kruskopf he will be pro-duced before the court on Tuesday for remand hearing.